Why would you travel into the desert to join a massive protest? This is a page about a visit to the Baxter detention centre, The Baxter Convergence planned for the weekend of Easter 2003. Below are some reasons people have for going to Baxter in a mass demonstration. Like the event in Woomera in 2002, it promises to be an international event; eleborate organisation is well underway. 30 January 2003: Open Letter to Politicians Full Of Questions About Refugees - We're asking a barrage of questions about visiting Iranian Mullahs to Canberra, the secret plans to deport 190 Iranians from Australia, and on this page we're including questions about Minister Ruddock being scared for the UN Committee Against Torture or the UN Human Rights Committee. 31 January 2003: Going for Baxter, going for broke - Our page about the Baxter Centre. 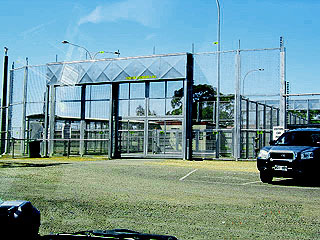 Come Easter 2003, thousands of people will visit the Baxter Detention Centre. Why are they going? Will you be one of them? Updated with many links to related pages. 31 March 2003: A list of Frequently Asked Questions about Baxter2003 - Many people are again expected to converge on the Baxter detention centre during the Easter weekend in April 2003. Some people comment or indicate doubts as to the usefulness and safety of a protest, and the subsequent impact on those incarcerated inside. These FAQ's formed on the network lists. 1 April 2003: Camping around Port Augusta: a guide to camping and overnighting - Since DIMIA does not provide accommodation for Australian and International tourists and backpackers, you're left to the devices of guy ropes, tent pegs, your water bottle and the gas campstove for your holiday stay. Our consultants from "Unusual Tourist Ventures", a Melbourne based company, have prepared this report (but note the page date). Below is a message recently received from detainees inside the Baxter detention facility, Port Augusta. In good faith we would like to express our deep concern about our miserable situation. For a long time we have been stuck in detention. We are of different races, different nationalities, different languages. All of us escaped our countries because of persecution or war. Unfortunately, our applications for protection visas have failed. The government policy is so hard, so tough - they don't want to grant us protection, even on humanitarian grounds. At the same time they are threatening to deport us to our countries of origin. If we return to our countries, it will put our lives in great danger. But after death, we cannot talk to any social organisations such as Amnesty International or the Red Cross. Only our dead bodies can prove that we have been persecuted. We are so confused, we don't know what we can do. We came to Australia for protection but we have got only detention. If we remain in Australia, we will be productive citizens in the future. We will never regret, never look back. We will live in harmony. We are humbly requesting the Australian people: Please help us. Consider us as human beings. Solve our ordeal. We will be grateful to you forever. Don't think that we are illegal in Australia. We are legal. When we came to your waters, we knocked on your door. We informed the government that we were asylum seekers, that we wanted to enter your country. So by order of the Government, naval forces brought us to the mainland. So we are not illegal. Of course, when we entered your country, most of us had no legal papers. You should understand that people who are really refugees, it is not possible for them to access passports or any legal documentation. Everywhere, when a refugee goes to any country, they cannot go the "proper" way. Look at Europe - refugees cross borders without papers, always from third world countries. In their country they cannot stay for fear of persecution. So they have to move without papers. If anyone can access legal documents and a passport, and use them to cross through immigration and customs, they have no problems. That's why original refugees come without papers. If you look in our eyes you will see naked pain. We are treated very harshly. They humiliate us every waking moment. They harass us. Sometimes they even bash us, use teargas on us. It was beyond our imagination that such a civilised liberal democratic country could do this to us. It is our desperate desire, by any means, to be released from this detention. As a massive act of solidarity with those who - in breach of justabout every International convention - are indefinitely locked behind the 9000 volts fence and barricades, thousands are likely to flock to this new hell-hole of the Australian dictatorship of John Howard. Below are some of the reasons people have to be part of the Baxter event this coming Easter. Many of you here will have similar feelings toward mandatory detention as an inhumane and destructive policy. Along with many other individuals and organisations, the United Nations has condemned the practice of keeping people for indefinite periods in Australian detention centres. Children, in particular are likely to be traumatised, witnessing acts of desperation and self-harm. Although this government has involved Australia in aggressive conflicts that will inevitably displace thousands of people, they are still not prepared to welcome asylum seekers and treat them with compassion and respect. Many asylum seekers are separated from their families and detainees are given little access to legal information and advice. There is also a distinct lack of independent monitoring and accountability. Mandatory detention and the oppressive penal environment in which people are placed inevitably foster fear and resentment, not only in those looking out through the razor wire but for many of those looking in. It amounts to torture of those who are detained and will have lasting and damaging effects on them. There are better and more humane alternatives to the current system of responding to people who seek refuge here; alternatives that reflect the generous and compassionate spirit of the majority of Australians. Thank you for your work in drawing attention to the plight of the many people held in detention in Australia and my best wishes for your Easter campaign at Baxter. The refugees in Baxter are scapegoats of a government that has nothing positive to offer. Instead of public schools and hospitals, we get military spending for a war on Iraq, which will cause more refugees to flee in misery. On meeting people of various nations when travelling in Vietnam last year I was often embarrassed at their statements on our treatment of refugees. There was a time when when travellars talked of America and Israel in this way, not Australia. It is our responsibility to stop this quasi-fascist use of concentration camps by our government and so regain our humanity and democracy. Just over the last couple of years I have changed my attitude towards leaving it to the authorities to in a just manner deal with issues of Human Rights. Having previously never considered myself as a protestor I now come to the realisation that I must speak out. I will be travelling to Baxter at Easter as a statement of my objection to this horrific policy of mandatory detention. This time I won't be watching the show of strength on the TV, I'll be there. The actions at Easter last year (Woomera 2002) was a big wake up call and this time I will go and encourage others. Baxter is a maximum security prison for those who have not committed a crime. Asylum seekers are being incarcerated for seeking refuge! It is a concentration camp that processes humans with dignity, pride and courage into traumatised and psychologically tortured illegals by name. Our ovens are in the soul - Baxter, like all the camps, attempts to dehumanise our fellow humans. Along the way, the camps dehumanise us because these dehumanising processing plants exist. They exist but NOT in my NAME. So, I'm going to Baxter this Easter to radiate some soul, in other words - give hope to our brothers and sisters behind the razor and electric wire. If our government is about dehumanising people then it is up to us to radiate our humanity through and beyond the electromagnetic forces of the electric wire at Baxter. I am planning to participate in the protest at the Baxter concentration camp during Easter because this government's policies and practices regarding refugees and displaced people in Australia contravenes its obligations under key international treaties to which we are signatory, including the Vienna Convention, the Universal Declaration of Human Rights, the Convention on Civil and Political Rights, the Convention on the Rights of the Child and the Convention Against Torture. The Australian government is using its incumbency to implement racist, inhumane and divisive policies. This is an abuse of power that is unacceptable in any country and I want the world to know that John Howard and his cohorts are acting illegally and without the support of the Australian people. Under the Howard regime, we are no longer a democracy. All of the compounds are constructed in a circular fashion with a continuous facade. There are no outward looking windows. Each of the compounds has at least two guards on duty. There are many cameras in each compound. The only place to be out of camera range is to stay in your room, or in the toilet. Detainees told us that it takes five days to receive medical attention, and that when you do you will be told to drink lots of water and given Panadol for every ailment. There is no education happening for the children. The people we met and talked of included a pharmacist, goldsmiths, engineers, teacher, electricians, psychiatrist, many students, a person who had read all of Shakespeare's works in Farsi, and were familiar with most of the Western classical traditions in literature and music, boys from Afghanistan who want to go to school, to contribute to Australia; children who love math, physics, and chemistry and can't wait to go to university. One woman knits a jumper, then unravels it and knits it again to keep herself occupied. One television channel, but the picture is ghosting, two videos per week. People my age looked 20 years older, haggard and saddened. Two men were taken to isolation for not saying 'please'. They were told they had to say please before they were given a glass to drink from. People who ACM wishes to punish are placed in isolation. Cells are single rooms with a toilet. The room is fitted with cameras so people know they are being watched on the toilet. Food is brought to the cell. The sentence in isolation ends when ACM chooses to bring a document which the isolated person signs, admitting to ACM's version of what preceded the lockdown and promising not to do 'it' again. As with all prisons, 'order' is maintained with physical and chemical restraints, cameras, electricity, Valium, Zoloft, and Terazepan. It seems that the effectiveness of the refined punishment in White 1 compound (strip searches, handcuffs and tear gas, removal of furniture, constant room searches etc) has come to the fore, with many detainees relinquishing under the pressure from DIMIA and ACM, and signing deportation papers. Most of these people will not be returned to their country of origin. DIMIA employees are now working weekends to attend to the Immigration department's demands to pressure detainees into returning to their homelands, regardless of the stage of the detainees' application processes. Found at the Baxterwatch website (taken off-line January 2006).